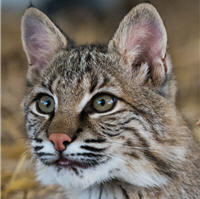 Jezebel is an 8-week old female bobcat we picked up from a homeowner in Mt. Pleasant. We aren’t sure how long Jezebel had lived with them, but we could tell she was pretty used to being handled. They said they were outside doing yard work and saw this little kitten walking around. When they approached her, she walked right up to them. They took her in and kept her for some time. Shortly before Jezebel came to us, we were contacted by Plano Animal Control about another baby bobcat they had picked up from a different homeowner. 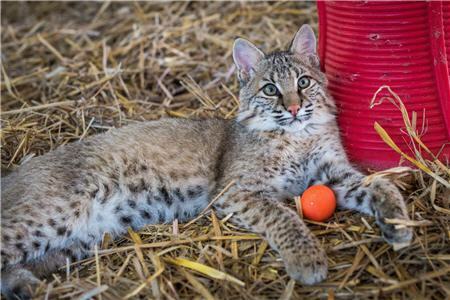 When we got the call about Jezebel, we were pretty excited – both kittens were young enough they could be rehabbed together and then, returned to the wild where they belonged. It would take some work to get Jezebel to act like a wild bobcat but in the right situation, we felt it could be done. 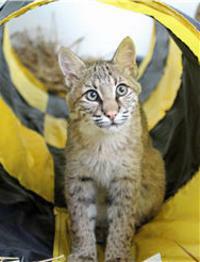 Before we could get Jezebel and the other kitten to the rehab facility, Jezebel had a seizure. Because Jezebel continued to have seizures, we decided to keep her at In-Sync for 24/7 monitoring and assessment. We took Jezebel in to have an MRI on her brain. The results were almost exactly the same as the condition that our little Gideon has. Based on some of the things the previous owner told us, we believe she was probably having seizures before we picked her up. They told us that she would be really sweet and cute then, all the sudden, she would turn all bobcat – screaming and lashing out. Since we have been able to control her seizures, she is more playful and she doesn’t have the spells and outbreaks of lashing out. As much as we’d like her to be able to be rehabbed and returned to her home in the wild, Jezebel will now call In-Sync home. We will do our best to make it as wild for her as possible!